The view was absolutely amazing and the outside kitchen set up was a fabulous way to cook for our large group of friends! We had an amazing time up at the Antiparos View Apartment and we'll be back! Thank you! Tutto è stato perfetto! Anna è un host fantastico! Η φιλοξενία από την ιδιοκτητρια ήταν παραπάνω από εξαιρετική. Την μέρα της άφιξής μας, μας περίμεναν στο δωμάτιο πάρα πολλά φρούτα για όλες τις μέρες της διαμονής μας, χειροποίητο εξαιρετικό κέικ φτιαγμένο από την ίδια, και μαρμελάδα επίσης χειροποίητη, βουτυρο, φρυγανιες (επαρκούσαν για όλες τις μέρες). Ένα επιπλέον που μας εντυπωσίασε, στο μπάνιο είχε πλήρως εξοπλισμένο φαρμακείο με φάρμακα πρώτης ανάγκης. Επίσης πιστολάκι, σίδερο και πλήρως εξοπλισμένη κουζίνα και ομπρέλα θαλάσσης και πετσέτες θαλάσσης. Παρόλο που το δωμάτιο μας ήταν ημιυπόγειο (νομίζω όλα τα υπόλοιπα είναι ισογείου) είχε δική του βεραντούλα και σημείο στον κήπο με υπέροχη θέα, και ήταν το πιο δροσερό δωμάτιο που έχουμε μείνει. Το συστήνω ανεπιφύλαχτα για ζεστές μέρες. Η Ελλάδα έχει γεμίσει καβαλημένους ιδιοκτήτες και κάτω των προσδοκιών και η ιδιοκτήτρια του συγκεκριμένου καταλύματος είναι η φωτεινή εξαίρεση!!!!!!! Posizione splendida in collina, panoramica, fresca, silenziosa; giardino della struttura bello e ben tenuto; possibilità di parcheggio; appartamento carino, arredato con gusto, dotato di molti comfort (tutto il necessario per cucinare, cartaigienica non centellinata; phon nuovo); essendo arrivate tardi la sera la proprietaria ci ha fatto trovare anche alcune cose per la colazione per il primo giorno e in generale è stata molto gentile e disponibile per ogni richiesta. Η εξυπηρέτηση από την οικοδέσποινα ήταν άψογη, το δωμάτιο ήταν πολύ ευρύχωρο και είχαμε όλα όσα ήταν απαραίτητα! 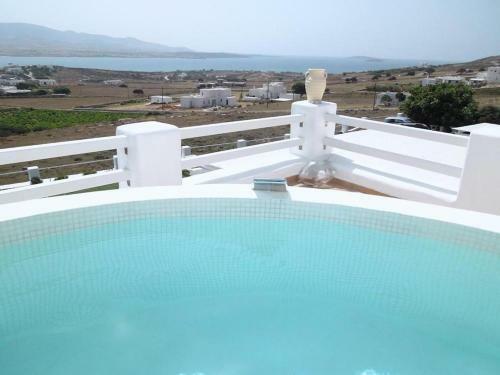 Lock in a great price for Antiparos View – rated 9.6 by recent guests! Offering a garden with sun terrace and BBQ facilities, the Cycladic-style Antiparos View is 0.9 mi from the center of Antiparos Village. It features self-catering accommodations with free WiFi and garden views. Psaralyki Beach is 2,650 feet away. Opening to a terrace, all tastefully decorated apartments of Antiparos come with 2 or 3 separate bedrooms. Each consists of a seating area and a kitchen with dining table and oven with hobs. Some units have air conditioning and a TV. Several restaurants, café bars and mini markets for the basic supplies can be found within proximity. Antiparos Harbor is a 2-minute drive away and free shuttle service is provided. 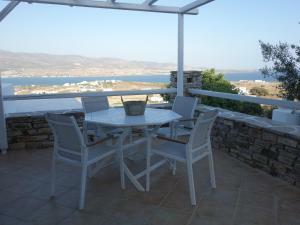 When would you like to stay at Antiparos View? Opening to a terrace with garden views, this air-conditioned and tastefully decorated apartment comes with 3 separate bedrooms. It consists of a seating area with TV and a kitchen with dining table and oven with hobs. Free WiFi is provided. Opening to a terrace with garden views, this tastefully decorated apartment comes with 2 separate bedrooms. It consists of a seating area and a kitchen with dining table and oven with hobs. Free WiFi is provided. Our complex is family run business, comprises of 4 villas, 3 of two bedroom villas and one maisonette of 4 bedrooms. It is built on a hill in the traditional Cycladic architecture style with much attention to details, providing all the modern amenities in a cozy and friendly atmosphere. Along with the warm hospitality of the us, our complex is the ideal place for a family holiday you will never forget. Our guests will be amazed at first by the breathtaking panoramic view of the Aegean Sea, the canal between Paros and Antiparos, the surrounding islands and the colorful sunrise. Then the warm-hearted people of our beautiful small island, the traditional small white alleys, the taverns located right by the sea serving delicious local cuisine, the exciting night life, the bright colors of the flowers and most of all the clear waters of the Aegean Sea will be something to remember dearly for the rest of your life. We are a meddle aged couple with two children. We love to have friends, to take care of them as well as to have fun with them. The complex located in a summer houses area, 1km far from Antiparos port, from the center and the beach.The road is asphalt but it is better to rend a bike, motor bike or a car. House Rules Antiparos View takes special requests – add in the next step! Antiparos View accepts these cards and reserves the right to temporarily hold an amount prior to arrival. Please inform Antiparos View of your expected arrival time in advance. You can use the Special Requests box when booking, or contact the property directly using the contact details in your confirmation. The internet connection disconnected every time you locked your phone. In order to stay connected I had to keep my phone open all day to receive messages.